Currently more than 6% MPs in the House of Commons and Members of the House of Lords are from an ethnic minority background. The latest available estimate from the Office for National Statistics (ONS) Annual Population Survey 2015 indicates that 13% of the UK population are from ethnic minority background. 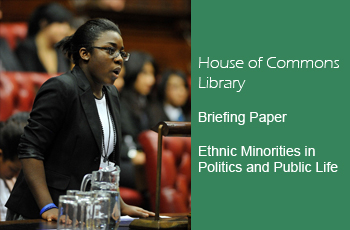 The number of ethnic minority female MPs in the House of Commons nearly doubled after 2015, from 1.5% (11 of 650) in 2010, to 3.0% (20 of 650) in 2015. Among other public sector organizations the NHS has the largest share of ethnic minorities. 17% of all NHS staff and 40% of hospital medical and dental staff in England are from an ethnic minority background4. This compares with 5% of National Fire and Rescue service staff. Analysis of ethnic minority representation is difficult, because ethnicity is both sensitive, and difficult to define. Work such as this generally relies on self-definition. The UK Census includes an ‘Ethnicity’ section, as do most staff surveys within major public services. However, it is not a mandatory requirement to disclose such information. Data on the ethnicity of Members is not systematically gathered and is an estimate based upon multiple sources.